FLYING PEGASUS (AUS) (Bay 2002-Stud 2007). 3 wins-2 at 2-to 1200m, AJC Royal Sovereign S., Gr.2. Sire of 197 rnrs, 78 wnrs, inc. SW King Saul (Western Australian Guineas, Gr.2), The Rising, Saint Bro, SP Star Quality, Soaring Lad, Western Fever and of Stable Secret, Baleen in Me, Pioneer Seven, Absolute Cracker, Flytego, World Trader, Beatnik Boy, Divine Hero, First Flight, Flying Lord, My Lovely Lovely, Nova Joe, Banana Boy, Hashtag, etc. World Trader (g. by Flying Pegasus). 4 wins. See below. Haddon Hall (g. by Danetime). 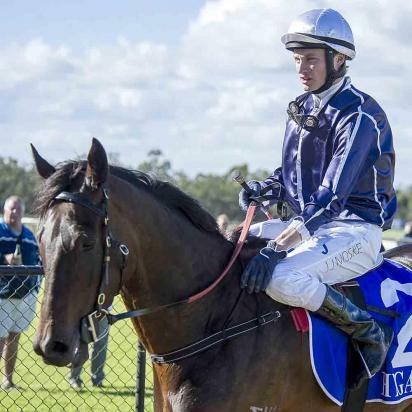 2 wins at 1300m, 1500m in Aust. Secret Elite. 2 wins-1 at 2-at 1000m, 1200m, WATC Elite Premium Beef 2YO H., Howard & Louise H., 2d WATC Eat More Veg 2YO H., 3d WATC National Boy 2YO H.
Secret Vault (Bletchley Park). 3 wins at 2, A$115,000, WATC NJ Way 2YO H., Winning Edge Presentations Classic 2YO P., Statewide Oil 2YO H., 2d WATC Beau Heed 2YO H., 3d WATC Belmont Oaks, L, Rotary of Perth H. Producer. Master Secret. Winner at 1200m, WATC Tabform H., 3d WATC Westspeed 3YO H.
TRANSLATE (Love a Dane). 5 wins-1 at 2-at 1200m, 1600m, A$493,135, VRC Matron S., Gr.3, SAJC FMG Consulting H., WATC Reed Resources Gold H., Priceless Matt 2YO H., Ascot Signs H., 2d VRC Myer Classic, Gr.1, AJC Emancipation S., Gr.2, MRC Mannerism S., Gr.3, WATC Belmont Guineas, L, Belmont Oaks, L, Burgess Queen S., L, Great Cat 2YO H., Westwide Financial Services H., Budget Mini Bus H., Westspeed 3YO H., Elite Beef H., 3d Western Australian Guineas, Gr.2, 4th MRC Tristarc S., Gr.2, WATC Champion Fillies S., Gr.3, Sires' Produce S., Gr.3, VRC Aurie's Star H., L. Producer. Rebel Waltz. 4 wins to 1200m, WATC Constructive Media H., 3d WATC Call TAB to Bet H.
EBONY MAGIC (Bletchley Park). 8 wins-3 at 2-to 1200m, A$171,815, WATC Gimcrack S., L, Yearling Sales 2YO H., Paklani 2YO P., Budget Rent a Car H., MVRC Tabaret H., WATC My Juliet H., Colours & Silks Cafe at Belmont H., Lloyd Meredith H., 2d WATC Singapore Orchid Rose of Summer Final, Mystic Chantry H., Better Food H., Ever Ready H., Birthday Welter H., 3d WATC Birthday S., L, Bankwest Trophy Welter H., BMW 3 Series Summer Scorcher H., MVRC Australian Bananas H., WATC Adlinkjls H., Northam H. Producer. COVERTLY (Metal Storm). 6 wins-4 at 2-from 1000m to 1600m, A$764,840, WATC Railway S., Gr.1, Sires' Produce S., Gr.3, NJ Way S., L, Crystal Slipper S., L, Toohey's New 2YO H., Victory Dash Welter H., 2d WATC Lee Steere S., Gr.2, Gimcrack S., L, Bungler Welter H., Spectrum H., Proud Treaty H., 3d AJC Flight S., Gr.1, STC Tea Rose S., Gr.2, WATC Laurie Holyoak H., 4th AJC Silver Shadow S., Gr.2, WATC Karrakatta P., Gr.2, NSW Tatt's RC Furious S., Gr.3, WATC Ruabon S., L. Producer. SO SECRET (Danetime). 5 wins to 1200m, A$305,475, WATC Colonel Reeves S., Gr.3, Westspeed 3YO H., West Cape Howe Wines H., Buckshot Bandit H., Westspeed H., 2d WATC Belmont Newmarket H., L, Beaufine S., L-twice, Perthracing.com.au H., Ros Reef H., Thornlie Hotel H., 3d WATC Goodwood Sprint H., L, Rory's Jester H. Sire. SECRET LINK (Encosta de Lago). 6 wins from 1400m to 1650m, A$135,255, WATC December S., L, Clear Mak P., Resolution H., All Spark H., Silver Meadow H., 2d WATC Belmont Guineas, L, Dayana S., L, Rogan Josh H., Reinella H., 3d WATC Belmont Sprint, Gr.3, Budget Fastbreak H.
Siesta Park (Seignorial). 5 wins from 1000m to 1600m, A$139,660, WATC Doctor Golly H., MRC Regal Wench H., WATC Busy Raider H., 75th Anniversary H., 2d WATC Burgess Queen S., L, Key Business H., Zabaset H., Rocky Murano H., Limitless H., Mourilko H., 3d WATC Matchmaker Classic, L, Preened H., Ironport Email Security H., 4th WATC Belmont Oaks, L. Producer. Race Record: 17 Starts 4-3-0 A$73,148. 4 wins at 1200m, 1400m, WATC Magic Millions Yearling Sale H., Grant Thornton H., 2d WATC National Apprentices' Chalenge H., Belmont Bonanza H.